"The past is gone, but something might be found to take its place." Welcome to the ICS Interest House's home in cyberspace. 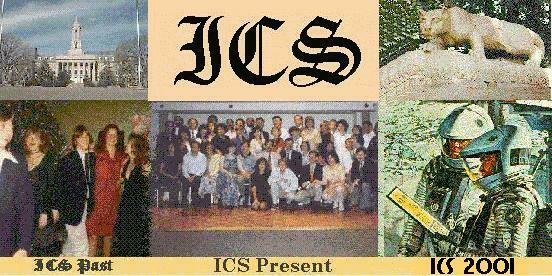 This site grew out of the first ICS Reunion held almost 20 years ago in the summer of 1996. This is the main homepage. There are links to pages centered around the past (e.g., Leete trivia), the reunions (the most recent one was in June, 2016). The Where Are They Now page has information and links that might help you to track down old roomates and fellow alumni. If you have any luck, let me know, so we can add the name and address to the mailing list for the next reunion! The Items of Interest page includes automatically updated current news about Penn State sports and Penn State in general, from both the Penn State information office and the Daily Collegian. Be sure to check out the latest happenings at our alma mater. (Be patient, this page takes 5-10 seconds to load while it gets the latest news). If you're a Leete alumnus reading these pages and haven't gotten a current address, email, or phone number into the reunion organizers, please send your contact information to mike.mcgurrin at (use the @ symbol) gmail.com. We'd appreciate contact info on other alums you're in touch with as well. Contact info will NOT be published without permission. Also, if you have any suggestions or material for this site, let me know by dropping me an email at the same address. Old pictures from your Leete Hall days would be greatly appreciated. We're especially looking for contact information and pictures from Fall '74 through 1980! I can take electronic or borrow you prints for scanning and send them back. This website has information and news that I hope you find of intererest. For active, interactive discussion, checkout our Facebook page: Individual in a Complex Society / Leete 1 Alumni. We also have our own LinkedIn group: Penn State Alumni - ICS 1st Floor Leete Hall. The LinkedIn group is an outreach effort to find and connect to alumni, not an active group. Facebook is where the discussions are at, and this site you're reading remains our virtual home. There will be a reunion in 2019! It will be held on June 21-23. Check out the 2019 Reunion Page for more info, and head over to "Leete Alum" on Facebook for all the details and updates (it's a member's only page, if you are a 1st Floor Leete / ICS alum, just request membership). Pictures from the 2016 reunion have finally been added to the 2016 Reunion page. We have our own little trivia game on Alexa! Just say "Start ICS Trivia." And if you have suggestions for more questions for a possible version 2.0, just send them to me. We need pictures! I've gotten a lot from the early years, but we need pictures from '74 and beyond. If you have any, please send them. Want to know when there's new stuff here? Use the free automatic webpage monitor, below. It monitors this page, and emails you when I update it. Significant updates are almost always mentioned in the What's New section on this page, so only this page needs to be monitored. Donna Gasper, for her incredible efforts pulling the reunions together. Guido van Rossum and everyone else developing Python, because it's a great programming language and I use it for the news feed script. Let's Encrypt for providing free security certificates to help protect all of us as we use the internet.